Some sage once said, “There’s a sucker born every minute.” Be sure you’re not one of them, when trawling the Internet in search of gainful employment! Among the ever-widening sea of job hopefuls, Internet job searches have increased by 7% in a two-year period (73% in 2007 versus 66% in 2005 as per The Conference Board). These figures include not only the unemployed and the soon-to-be-downsized, but also, individuals bringing home paychecks while searching for another employer to write them. Computer hackers and the downright unscrupulous are well aware of the state of our economy and all too willing to take full advantage of the gullible. “The gullible” are defined, for purposes of this article, as those who make it easier for their identity to be compromised, their finances stolen, and their dreams shattered, including fantasies of the perfect “work from home” jobs. 11,000 complaints concerning the latter, many of them linked to Internet searches, were filed with the FTC (Federal Trade Commission) in a single year (2007). The BBB, also known as the Better Business Bureau, projects that the stringent economy will produce escalating numbers of complaints from job candidates ripped off online. To ensure that you do not fall into “the gullible” category, please take heed of our well-considered advice. 1. Your English teacher was right; we hope you paid attention in class. Reputable employers usually take care in writing their job descriptions/postings. Unfortunately, errors in syntax, punctuation, and spelling do slip through the cracks; this is one of the fallouts of living in an electronic age. However, honest employers do not make many such mistakes; they can’t afford to. Foreign rip-off artists, however, do. English is not their mother tongue. Their sentence structure is often not only faulty, it is downright confusing, and the emails will be rife with errors a fourth grader would not commit. Should you receive an email configured in this manner, understand that it is bogus. It is a scam. Purge it immediately from your system. Do not respond to it! Responding may open the door for them to hack into your computer, for in so doing, you will be giving the thieves your IP address and thereby, easy access to all of your personal data. 2. “There’s something wrong with your account.” Really? The account in question is one that you initiated on one of the many job boards, particularly the major ones. These are so accessible that you may not think twice about responding to an email claiming that something is amiss with your account. But if you don’t think twice, you could be in serious trouble. If you receive an email “alerting” you with a message of this nature, and if the email contains a link, don’t click on it. It may take you to a site that is in no way associated with the job board; in fact, the site may contain a virus or other harmful software tool that will demolish your system. If you are asked to submit all of your personal information again, who, in actuality, is receiving it? The job board or a hacker/robber? 3. Don’t get personal. Believe it or not, some job seekers open their Inboxes to find that, lo and behold, they have been “awarded” jobs for which they have never even interviewed. It appears as if they’ve won the lottery and indeed, the chances of the emails being genuine are about equal to those calculated to win the Mega Millions. The catch is that the “employer” requests a ton of very personal information from you, including the one piece of information with which you should be extremely circumspect: your Social Security number. 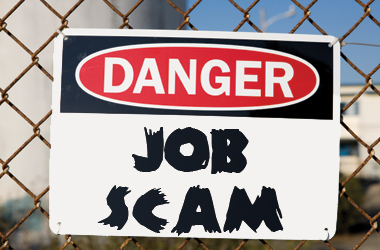 These are not employers but scam artists, so don’t feed them your information! 4. The “Work from Home” Lies. Hackers and robbers understand that the paucity of jobs, and the graying of America, has created a real market for them to mine by way of phony or trumped up “work from home” schemes. While a number of such job opportunities are real, the majority of them work to the employer’s (thief’s) advantage, not yours. Those that promise you riches in a brief span of time, and those that demand that you pay them up front for these “wonderful opportunities” are to be avoided like The Plague. Senior citizens are not the only ones who are targeted. Students, stay at home moms, and disabled individuals are also at risk here. Do your research thoroughly before you commit to any “work at home” program. Contact the BBB at www.bbb.org if you have questions. 5. London Calling. It doesn’t have to be London, but the so-called employer does need to be far enough away so that he demands that you wire money to him via the usual routes (Western Union or a MoneyGram). Allegedly, the money is for a start-up fee for a “work at home” job, or some form of equipment, or supplies, or even a uniform required to perform the work. The phony employer may send you a small check for your initial efforts and then request that you send a heftier amount to him. Do the math. Who comes out ahead? Be smart. Be alert. Don’t be a victim! Thank you for publishing these timely and insightful tips. I’ve been n business long enough to pretty much know a scam when I see one, but other people may not. I’m sure this article will be very helpful to them. My sister was a victim of a work from home scam. She is a little poorer now but a lot wiser. Thank you for sharing this information so generously on your site. Thanks for saying so, i like it. I need some time to think about this. I’m agree with you, i recently came across your blog and have been reading along.. Can’t wait to see what you write about. Go for it! If you really want your information to be secure, start by unplugging the net. Hello, it looks like your site is up and coming in the Alexa rankings. hey this blog is great. I’m glad I came by this blog. Great article. Keep posting more imformative publications. Been surveying your web log for 5 days at present and I should state I am beginning to like your post. I wish to know how do I subscribe to to your web logs? Hello, having read your post, I’m beginning to think I am subscribed to too many blogs and I should start ranking them in a bid to determine which ones are still worth reading/commenting on. Thumbs up for this one! Yes, I am the offshore promoter that has scammed people in the past and provided client records to the FBI, IRS and Senate Finance Committee. My companies, of Rockford Global Solutions and Equity Development Group were put in place to soley to capture people trying to flee the U.S. tax system. I am sorry for what I have done and those I have hurt. I think your blog is good. I found it on Google. Really awful folk, exactly why do people feel the need to do this? Such awful individuals, why do people feel the need to do this?